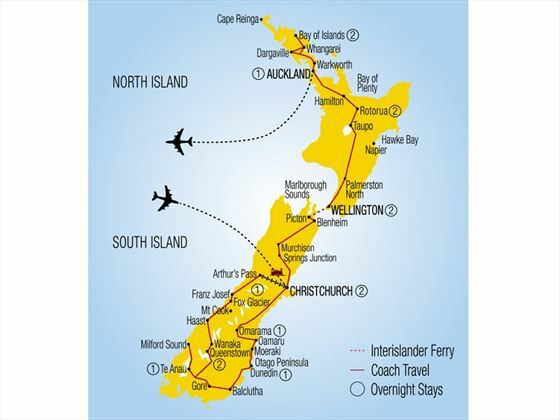 Beautiful cruises, an epic TranzAlpine train ride, fascinating museums, delicious food. 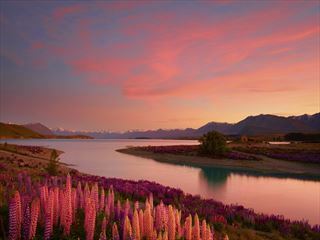 This 15-night escorted tour is an enticing way to discover all New Zealand has to offer, and make great friends along the way. 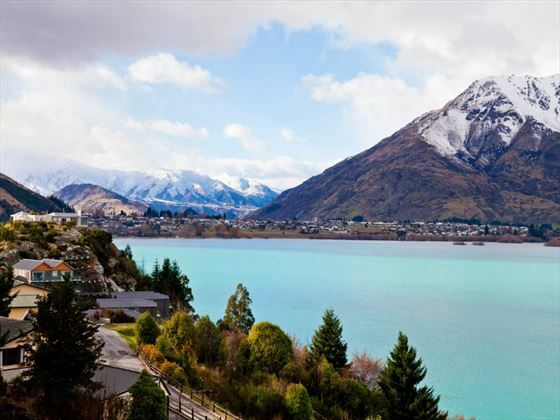 Starting in Christchurch and ending in Auckland, this brilliant adventure really packs a punch, including the likes of Wellington, Rotorua, Dunedin, Milford Sound, Queenstown, and the Bay of Islands into its jam-packed itinerary. From gourmet BBQ’s and picnics, to traditional Haggis and Maori Hangi celebrations, decadent food is a huge selling point of this fun tour. 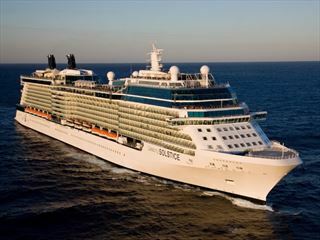 There’s plenty of ways to immerse yourself in the culture too, and so much opportunity for unforgettable sightseeing. Charming cities, soaring mountains, cascading waterfalls, unspoilt islands…you’ll truly see it all. Being a solo traveller tour, this is a fantastic way to meet like-minded people, and create exceptional memories with strangers who will soon become your friends (GPT). Once you’ve arrived into Christchurch, you will be met by a representative who will transfer you to your hotel. In the evening, join in with a fun welcome dinner and meet your travelling companions. 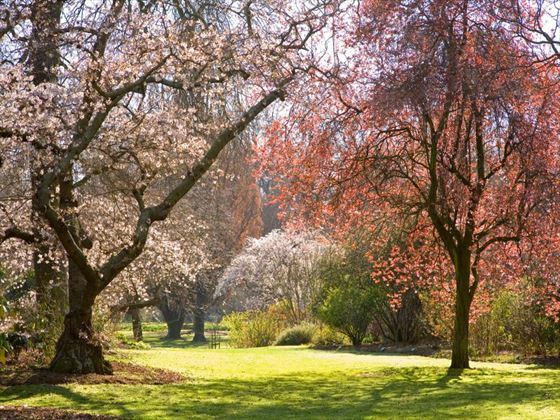 The morning will be spent on a city sights tour, before departing Christchurch and journeying through the southern Canterbury Plains to Lake Tekapo. Here you’ll discover the stunning turquoise water, visit the Church of the Good Shepherd and find the Sheep Dog Stature. There may even by time to enjoy a scenic flight over the Southern Alps (optional and at an extra cost) before travelling on to Omarama. Begin the day with a trip to Lake Benmore, before travelling along the Waitaki River to Oamaru, well-known for its jaw-dropping limestone. 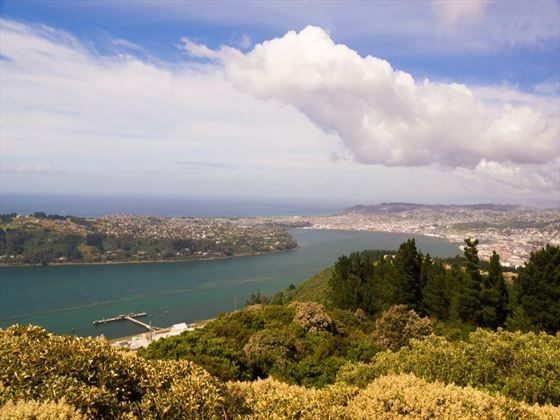 Afterwards, you will venture south to Dunedin for a fascinating city tour, along with some free time to explore for yourself. In the evening, you’ll enjoy a traditional Scottish night, with bagpipes, a special Haggis Ceremony and delicious food. Today you will travel via the Otago Peninsula to Larnach Castle, where you’ll learn about the buildings tragic and scandalous past. You’ll have a bit of time to explore the Garden of International Significance, followed by a tasty Devonshire tea. 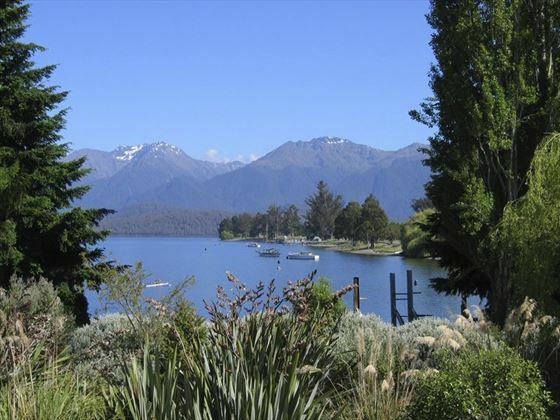 Soon you’ll leave Dunedin and travel through Balclutha and Gore to Te Anau, the picturesque gateway to Fiordland. Tonight, you’ll have the chance to visit the Te Anau Glow Worm Caves (optional, and at an additional price). 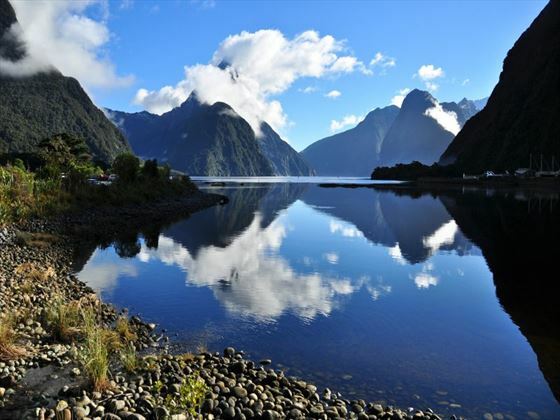 Your day will begin with a fantastic cruise along the magnificent Milford Sound, marvelling at the Bowen Falls and soaring Mitre Peak as you tuck into a picnic lunch. Afterwards, you’ll journey to Queenstown and have the rest of the day and evening to do as you wish. 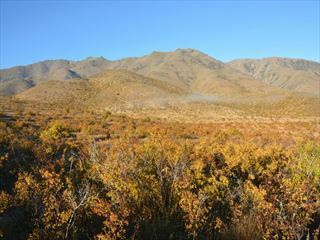 The whole day is free for you to explore Queenstown at your own pace. Your Coach Captain and tour guide can help you plan a day full of activities if you wish, including jet boat rides, getting up close to Kiwi birds, and enjoying a heritage tour to Skippers Canyon (all additional cost). In the evening, you’ll board the history TSS Earnslaw and cruise across Lake Wakatipu to Walter Peak Station. Here you’ll tuck in to a delicious gourmet BBQ prepared in front of you at the Colonel’s Homestead. After dinner, you will embark on a short farm tour, before hopping back on to the TSS Earnslaw for a sing along by the piano back to Queenstown. The morning will be spent in Arrowtown, visiting the Lakes District Museum. 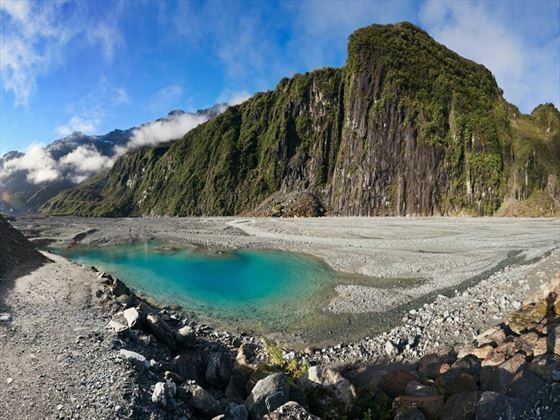 After a quick tour, you will travel via the Haast Pass to the marvellous West Coast, adorned with the snow-shrouded peaks of the Southern Alps. Travelling north to Fox Glacier, you might even have time for a scenic flight over the glaciers (optional, at an additional price). Beginning the day with a trip to Hokitika and its interesting Greenstone Factory, you’ll soon continue on to Arthur’s Pass to board the TranzAlpine, known as one of the best train journeys in the world. Travelling past the Canterbury Plains, beautiful rivers and valleys, the Waimakariri Basin and over huge viaducts, soon you’ll arrive in Christchurch. 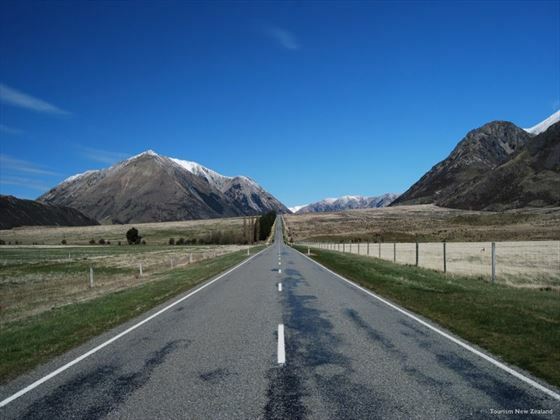 The amazing scenery Lewis Pass offers will be your first port of call today, travelling along to the Marlborough Country – well known for its decadent food and wine. Once in Picton, you will hop onto the Interislander Ferry to journey through the gorgeous Marlborough Sounds, across Cook Strait, and on to Wellington. The morning gets to an interesting start with a trip to New Zealand’s national museum Te Papa to see the Gallipoli: A Scale of War exhibition – a fascinating exhibition that uses cutting technology to tell the stories of extraordinary New Zealanders. Afterwards, you will board your coach for a great Wellington city tour and spend the rest of the afternoon and evening to do as you please. Your first journey today will involve spectacular views of Mt Ruapehu and Mt Tongariro as you journey to Lake Taupo. Once there, you’ll have the opportunity to see the cascading Huka Falls, before travelling along the Thermal Explorer Highway all the way to the geothermal beauty of Rotorua. Get your morning to a lovely start with a gondola ride and breakfast at the Skyline Rotorua, before enjoying a fun luge ride. The next stop will be Agrodome for a brilliant, fun-packed hour full of farming entertainment and education shows. 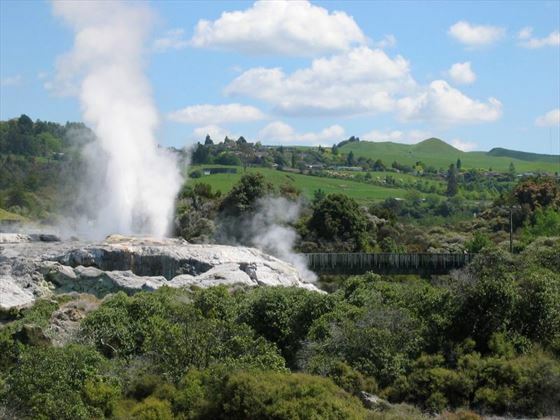 The afternoon will be spent at Te Puia, full of boiling mud pools and spectacular geysers that Rotorua is famous for, before having the rest of the day at your leisure. In the evening, you’ll get together with fellow travellers and enjoy an entertainment Maori Hangi and concert. On day 13 you will depart Rotorua and venture north via Auckland to the Parry Kauri Park, a great place to see the breath-taking Kauri tree. 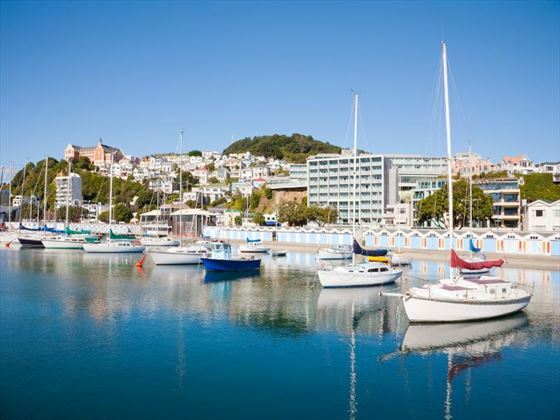 You’ll then journey on to Paihia, a charming town in the heart of the Bay of Islands. 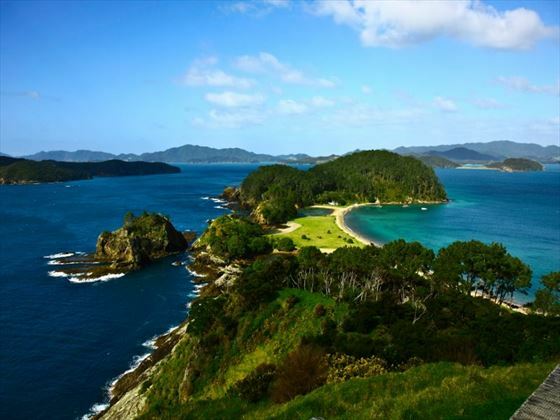 This is the opportunity for you to marvel at the stunning Bay of Islands, including delving into its history by seeing the location of the signing of the treaty between the Maori tribes and the British. Today will be spent sailing through the jaw-dropping Bay of Islands on board a luxury catamaran, journeying to Cape Brett and the famous Hole in the Rock. Along the way, be sure to look out for elusive bottlenose and common dolphins. The cruise will return to Paihia for a free afternoon and evening exploring. In the morning, you will depart the Bay of Islands and travel to Matakohe for an insightful talk at the Kauri Museum. 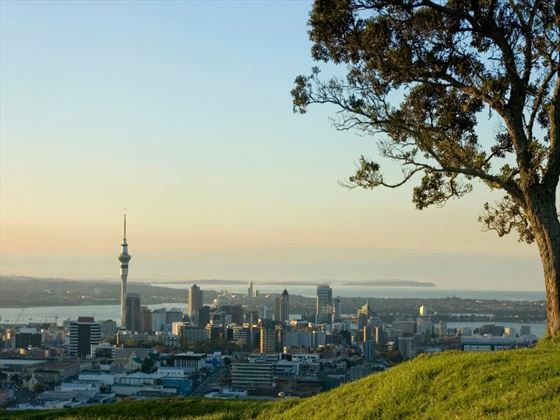 Once in Auckland, you will embark on a great city sights tour, before enjoying a farewell dinner with your new-found friends. Today marks the end of your tour. You’ll be transferred to the airport for your onward flight. All sightseeing and prepaid attractions: Haggis Ceremony, Larnach Castle, Milford Sound cruise, Lake Wakatipu cruise on the TSS Earnslaw, Lakes District Museum, TranzApline rail journey, Interislander Ferry cruise, Te Papa, Skyline Rotorua Gondola and luge ride, Agrodome, thermal mud pools and geysers, traditional Maori Hangi and concert, dolphin/hole in the rock cruise, Kauri museum, city tours of Christchurch, Dunedin, Wellington and Auckland.